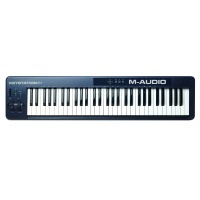 M-Audio Keystation Mini 32 MKII USB Controller with FREE Software (2014 Edition) - Step into computer-based music creation and performance with the Keystation Mini 32 keyboard controller from M-Audio. 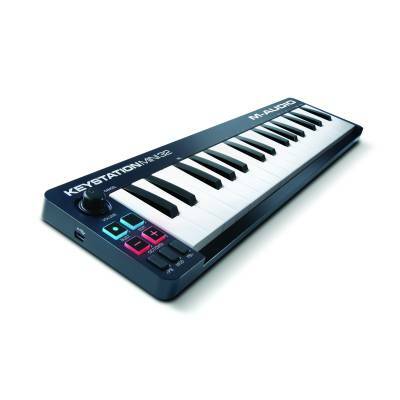 Keystation Mini 32 is a simple, powerful MIDI controller designed for sequencing music and playing virtual instruments on the go. 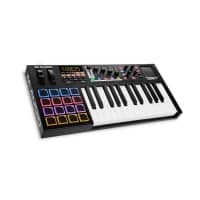 It features 32 velocity-sensitive synth-action keys and a series of controls that expand the range of playable notes and expressive capabilities. 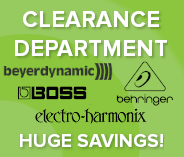 Use the pitch-bend, modulation, and sustain buttons to create dynamic performances or productions with your Mac or PC. 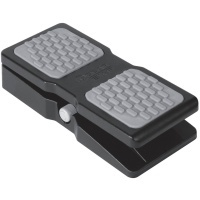 Plus, onboard octave controls allow you to access the full melodic keyboard range to play anything from bass lines to piano harmony to lead melodies. 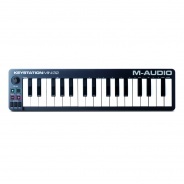 Lightweight and mobile, Keystation Mini 32 is perfect for traveling musicians who want to take command of music software during live performances, or producers who wish to add an intuitive MIDI controller with a small footprint to their studio. 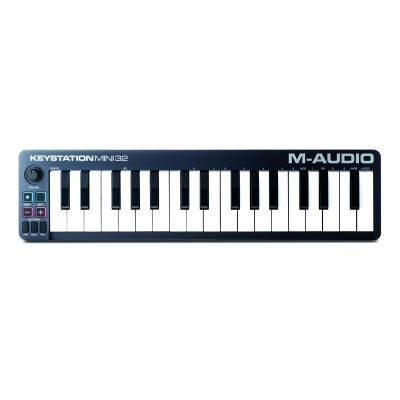 For an easy-to-use and portable setup, Keystation Mini 32 is USB-powered, class-compliant, and supports USB-MIDI connectivity. Plus, Keystation Mini 32 supports iOS connectivity with the Apple iPad Camera Connection Kit (sold separately), enabling you to perform and compose with audio apps on your iPad and other iOS devices. Bundled with Keystation Mini 32 is AIR Music Technology's Ignite software. With this intuitive music creation platform, you can capture your ideas quickly with professional results. Individual musical ideas are captured as phrases, simply called "clips." Multiple clips can be played back together, or even grouped to create more complex phrases and song sections. Ignite provides seamless integration with any current M-Audio keyboard controller, including Keystation Mini 32. 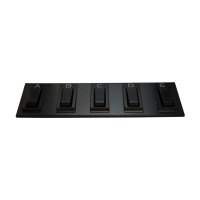 Once connected to your computer, the key parameters will be automatically assigned, or mapped, to the front panel controllers. This tight integration provides an out-of-the-box solution that simply works—with no additional setup to perform. 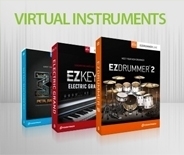 Included with Ignite are over 275 remarkable instrument sounds developed by AIR Music Technology. In addition to a versatile arpeggiator, Smart MIDI technology provides both a Chord Player and a Phrase Player that can introduce new musical parts to enhance your production—even a drum pattern. Email your ideas to the rest of the band. Share your musical ideas and songs with other musicians through SoundCloud—all without ever leaving Ignite. 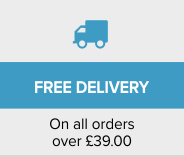 Plus, you can export WAV and MIDI files, and then import them into any DAW recording software. Also included with Keystation Mini 32 is Ableton Live Lite—one of the most popular performance and production programs available in the world. A powerful music creation tool, Ableton Live Lite enables you to spontaneously compose, record, remix, improvise and edit musical ideas in a fluid audio/MIDI environment. Explore sonic possibilities in real time whether on stage or in the studio. Keystation Mini 32 can interface with Ableton Live to extend performance and production capabilities. When you are satisfied with your work, Ableton Live Lite lets you save it or mix it down.